Dying Light must be one of the most fast paced open world games I have ever had the pleasure to play, the developers Techland, who made the original Dead Island in 2011 return to the genre after four years. This time round they have created a parkour free running zombie survival game that is both challenging and frightening, especially during the game’s night cycle, where you are hunted by fast and powerful zombies. Looking back at Dead Island, I cannot help but see similarities between the games style, not just the gruesome zombies. The graphics have been brought up to the next gen level, the devastated city of Harran and the surrounding area is beautiful at a from a distance and grisly up close, corpses littering the streets, most of them walking. Every asset is detailed and textured extremely well, and the game runs smoothly. The crafting system is great, being able to craft different weapons and tools like homemade grenades. Melee weapons degrade however, and more than once I was left in difficult positions when my weapon broke half way through fending off several zombies, thankfully, in Dying Light, you can climb, run and jump on anyone and anything to get around. 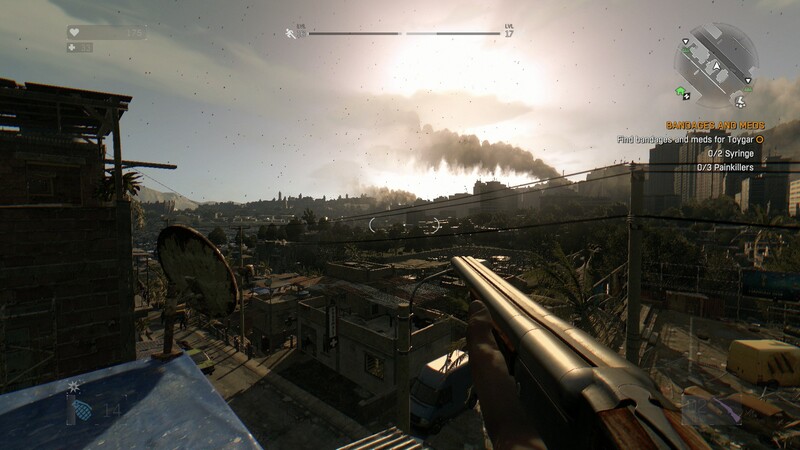 The main storyline follows Kyle Crane, an agent sent into the infected city to retrieve sensitive files for a government organisation, story aside, Dying Light shines in its open world exploration, I spent hours doing side missions, collecting crafting materials and discovering the games Easter eggs. Tagged Dying Light, Open World, PC, PS4, Review, Survival, XBOX ONE, ZombieBookmark the permalink.